Summer is the perfect time for fresh meals that don't require cooking. Full of protein and pretty, fresh ingredients, this summer salad recipe is a healthy, filling and refreshing meal, side or dip. You're going to love this black bean salsa salad recipe! Black bean summer salad is a favorite summer meal, side dish or dip. This healthy summer salad marries the meant to be flavors of tomatoes and cilantro with lime and corn. And with black beans as the base, this salad is full of protein and fiber. This salad comes together in less than 10 minutes and can be made ahead — the flavors blend beautifully when refrigerated. An extra win is that kids love black bean salsa as well, but we'll understand if you'd rather not share. 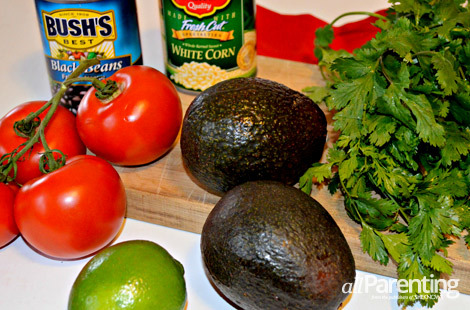 In a medium bowl, mix the black beans, white corn, tomatoes and cilantro. In a small bowl, mix the lime juice and red wine vinegar. Pour the mixture over the salad, sprinkle with a dash of salt and stir thoroughly. Right before serving, top the black bean salad with sliced avocado. Black bean summer salad is delicious served with chips as a salsa or a dip, as a topping for grilled chicken or fish or as a filling for tacos and burritos. It also makes a perfect meal topped with sliced chicken, or eaten all on its own off of a spoon!